This is a traditional dish from the “old country” – Austria. Since my mom is here she’s been busy cooking various delicious oldies such as this recipe from my grandma. 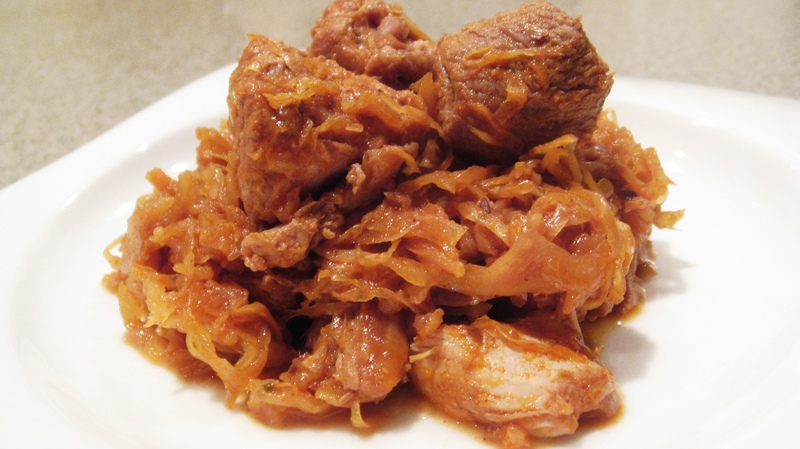 Sauerkraut, as with other fermented foods, has numerous health benefits and combining this with pork makes for an easy and savory dish. This is also a great meal to cook ahead, it is even tastier the next day. This recipe feeds 4 hungry people and with a side dish such as roasted sweet potatoes even more. We’re serving this dish tonight with some beautiful bacon cauliflower rice. In a very large soup pot, roast onions and garlic with coconut oil until golden brown, add Paprika, stir well and add meat. Stir in meat and add Sauerkraut, and all other ingredients and bring to a boil, then reduce heat, cover and simmer for about 2 hours. After about 2 hours, turn back up to medium high until almost all the moisture has evaporated, and serve. We hope that you enjoy this as much as we do. I made this last night and it was absolutely amazing. So easy to make, inexpensive and very delicious. I made it for guests who didn’t even particularly care for sauerkraut and everyone loved it! Looking forward to the leftovers. Pingback: 03/01/11 – Two More Days to Weigh In! This looks great–I’m a huge fan of pork shoulder (it’s one of the fattiest and flavorful cuts in my humble opinion!) and kraut. It’s on the meal plan for the week already! I can’t wait to try this recipe. I lived in Vienna many years ago and made a version of this recipe many times but forgot a few things over the years. Thanks for posting.it.